The Training area automatically lists your training sections, which trainees can checkoff as they go through them. Each training section can be made up of text, videos, graphics, or embedded documents (such as ppt, doc, or xls files), and they can be as long as you'd like. After trainees have viewed all of your training content, they can take proficiency tests to show that they've learned the material. There's also a Materials section where you can share files with your trainees. When logged in as the admin, you can create training sections and rearrange or edit them as you see fit. Proficiency tests are straightforward to enter and edit. There can be as many different tests as you'd like, and you can create multiple attempts of each test in case a trainee does not pass on their first attempt. As an admin, you can dive deeper into each user's account and see the tests they've submitted, how much time they spent on a training section, and their login history. You can also change any of their account information or reset their password (though there's a self-serve option as well). 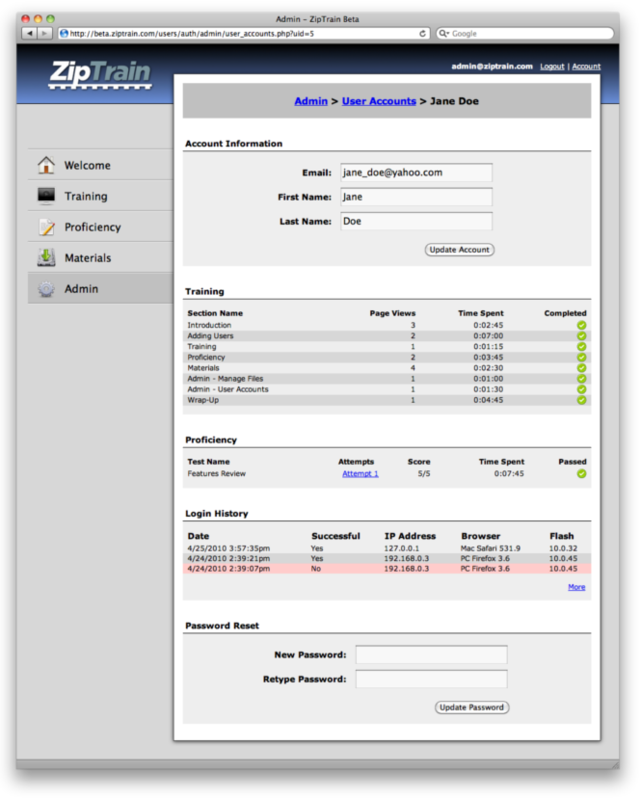 Uploading and managing your files on the website is a breeze. You can also create public pages as well. Special wiki-like "ZipTrain Code" lets you format and embed assets into the pages, training sections, and tests, which all have handy Preview buttons. 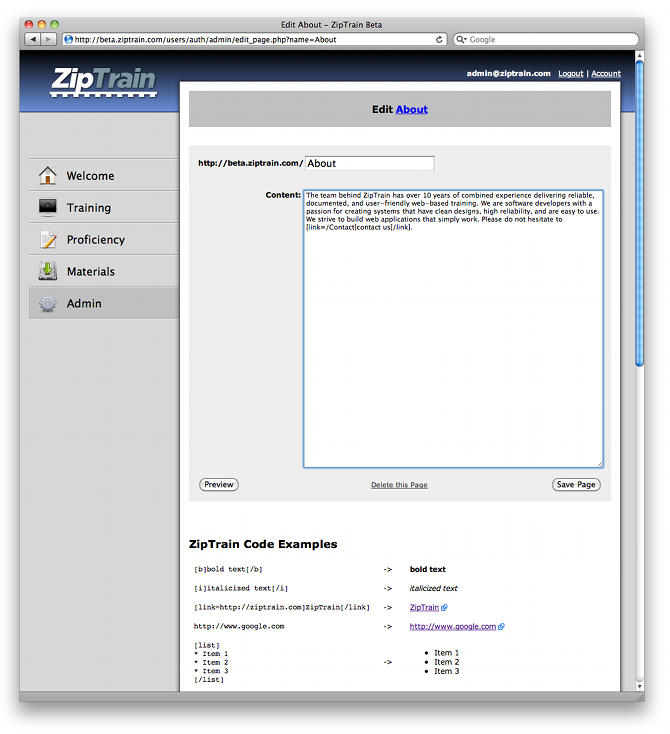 Your trainees register on your ZipTrain website and then work through your training materials and proficiency tests at their own pace. 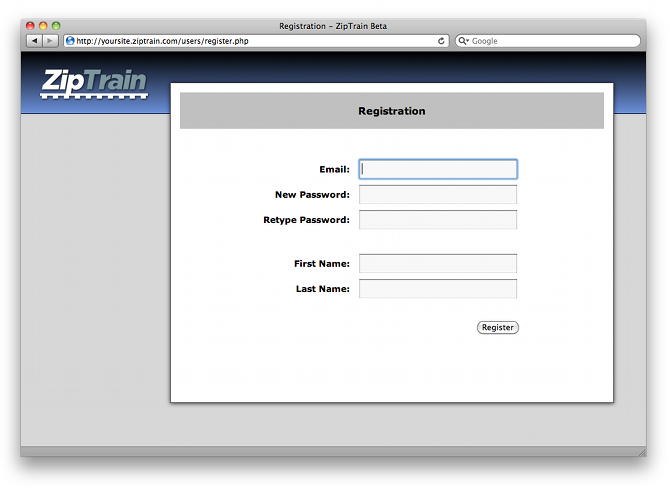 Can ZipTrain help with your training efforts? Just Contact Us!